With Eurofurence just a little more than 100 days away (oh my god) it's time for our 1st annual spectacular EF travel update! Do remember that the low-emission zone starts just around the corner from the hotel though, so if you feel like driving anywhere within the central districts of Berlin (i.e. you are totally crazy and in dire need of professional help) you will need the appropriate sticker for your vehicle. 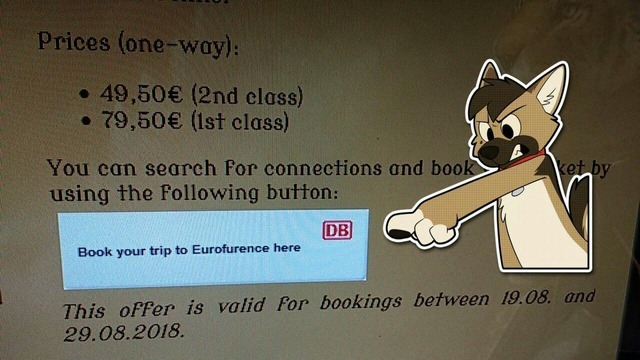 Note that at this early stage the site will also offer you other DB fares that - depending on your route and the distance you're travelling to Berlin - might be slightly cheaper than the Event ticket &mdash; however, there is a certain threshold that must be sold for a specific event so if you want to help Eurofurence out, book the ticket even if it is slightly more expensive than the other options. Thank you! Yeah, we have overflow hotels. What we don't have yet is a special rate, as our hotel liaison was unable to get in contact with the involved people within a reasonable timeframe (the Berlin hospitality industry can be agonisingly slow at times, I'm afraid). For the andel's, further announcements on how to book will be made soon. For the Vienna House easy, you can book through the web site linked above. If you'd like to know more about hotels in the immediate area around the Estrel, you can also look at this thread at https://forum.eurofurence.org/index.php/topic,6063.0.html and the announcement at https://forum.eurofurence.org/index.php/topic,8039.msg72123.html#msg72123 . Also, a word about airBnB. Be aware that airBnB is tightly regulated in Berlin, and the Berlin senate is actively shutting down illegally run hostels. We've had a few cases where EF attendees were put in an uncomfortable situation because of their booked accomodation suddenly disappearing without warning.